While Mary and her family were still in Kansas, the Wicksall family headed back to Michigan although there is no record of Nicholas or Deborah returning. 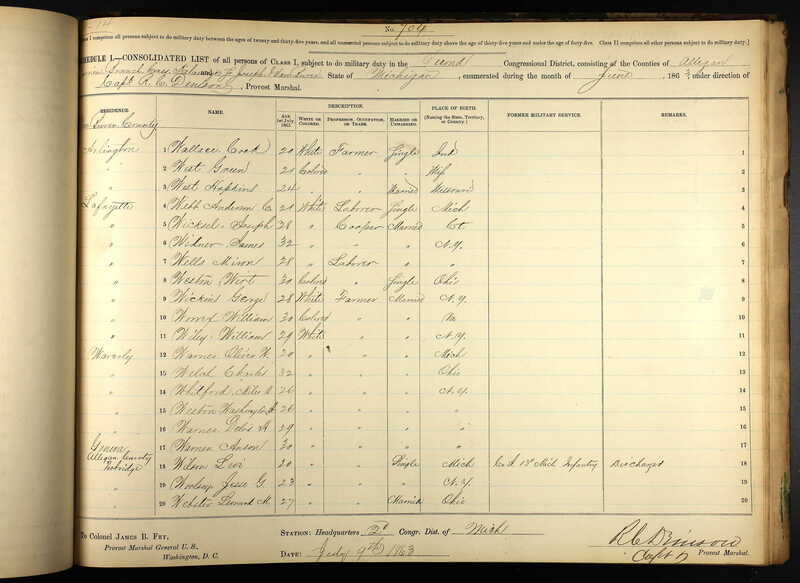 In July 1863 Joseph Wicksel appears on the U.S., Civil War Draft Registrations Records in Lafayette, Van Buren, Michigan. He is a 28 year old married cooper born in Connecticut. Although the birth of his children show a gap that could be explained by the Civil War, there is no further evidence that Joseph actually fought in the war. Although today there is a township called Lafayette west of Saginaw, this is not the Lafayette mentioned in the Civil War record. 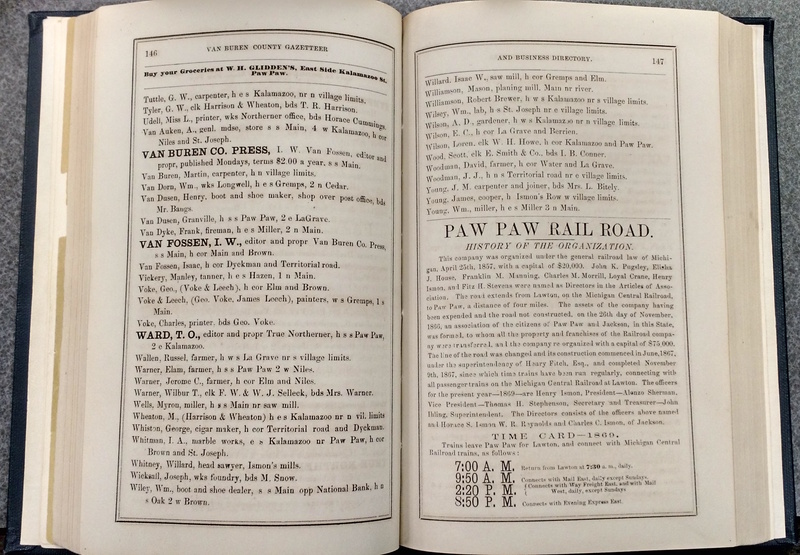 The book “History of Berrien and Van Buren Counties Michigan” published in 1880 by D.W. Ensign states “This township, originally called Lafayette and rechristened Paw Paw in 1867”. Of course this makes sense because the Wicksalls had spent some time in the town of Paw Paw before. Paw Paw appears to be where the Wicksall family finally settles down and it’s the place where the rest of Joseph and Selena’s children are born. It is also the place where Wicksall begins to be consistently spelled with an ‘a’. On February 25th 1864, Charlotte Vietta Wicksall is born in Paw Paw. Most records list her as Ettie or Vietta. On June 3rd 1867, Grace Wicksall is born in Paw Paw. In 1869 Joseph Wicksall appears in the Van Buren Gazetteer. 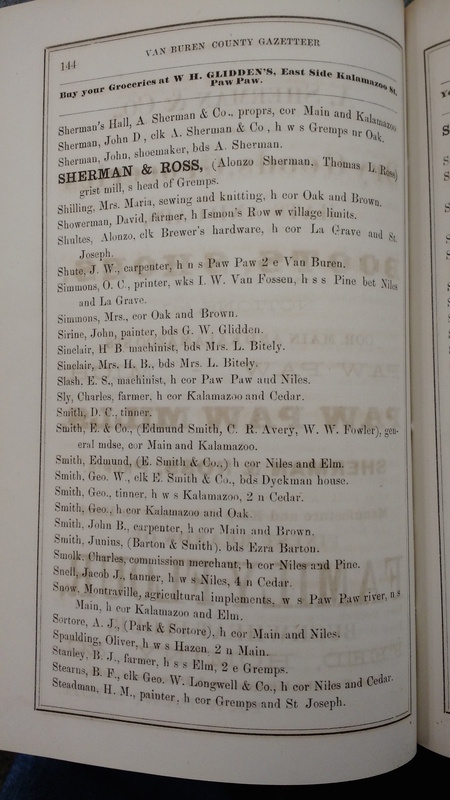 On page 146 it says Joseph works at a foundry and boards with M. Snow. 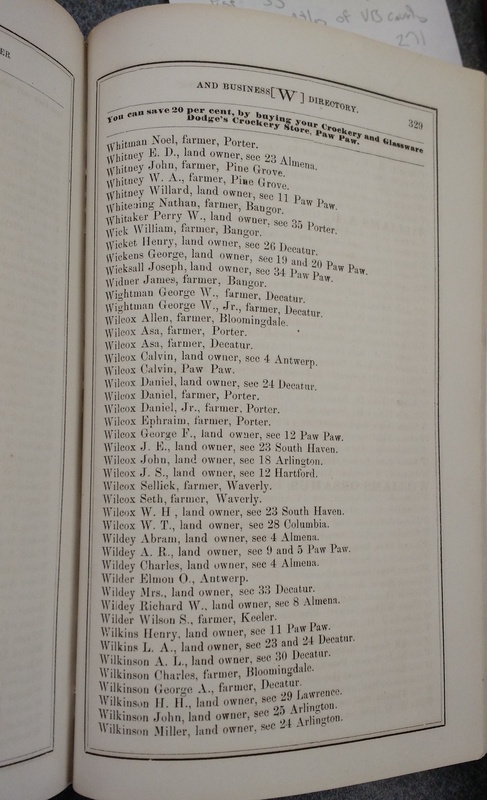 On Page 144 there is a Montraville Snow “agricultural implements, w s Paw Paw river, n s Main, cor Kalamazoo and Elm.” On page 329 Joseph is listed as a landowner in section 34 of Paw Paw. 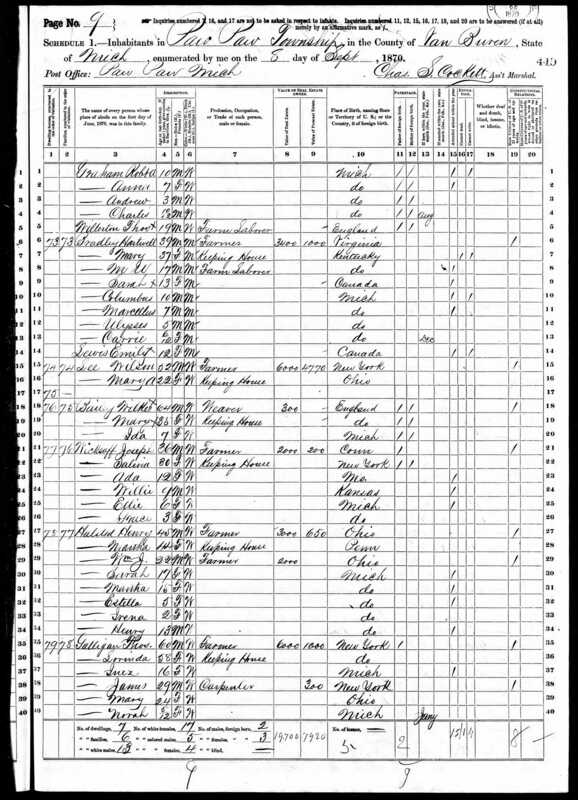 The Wicksall family is on the 1870 United States Federal Census living in Paw Paw. This record was difficult to find due to the fact that the name was misspelled Wicksaff. Joseph is listed as a 36 year old farmer born in Connecticut. He owns land valued at $2000 with a personal estate valued at $200. The census also shows his father was of foreign birth. Salina is listed as 30 years old, her occupation is “Keeping House” and her birthplace is listed as New York. Both parents are listed as foreign born. All of the children are here: Ada, Willie, Ettie and Grace. The Census also implies that the adults can read and write due to the lack of marks in the "Cannot Read" and "Cannot Write" columns. 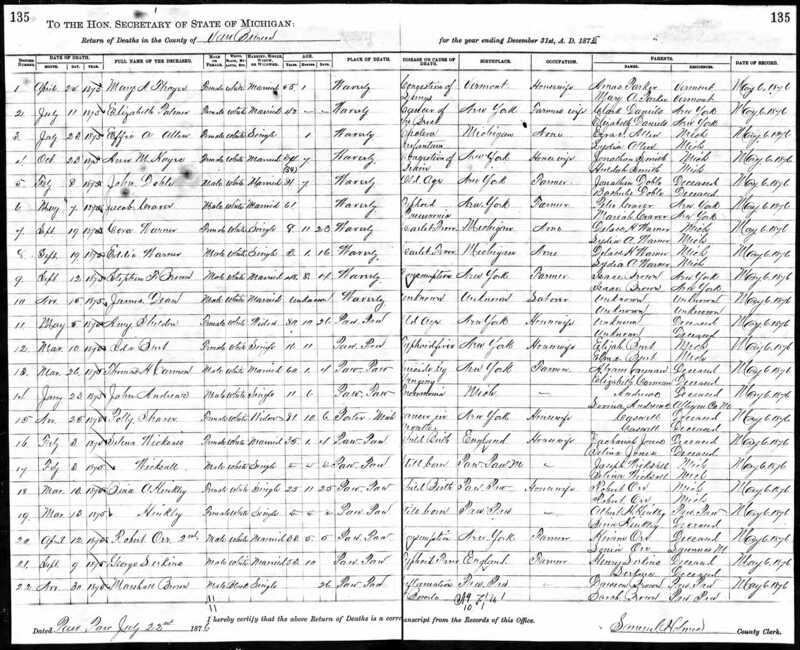 Joseph is also listed on the 1870 Federal Census Non-Population Schedule. He has 26 acres of “improved” land and 15 acres of woodland. He has 2 cows, 4 “other cattle” and 5 swine at a total value of $170. He also grew 100 bushels of indian corn. On August 19th 1872 Guy Joseph Wicksall is born in Paw Paw. All of the Wicksalls currently living in the Finger Lakes region of New York are descendants of Guy Joseph. 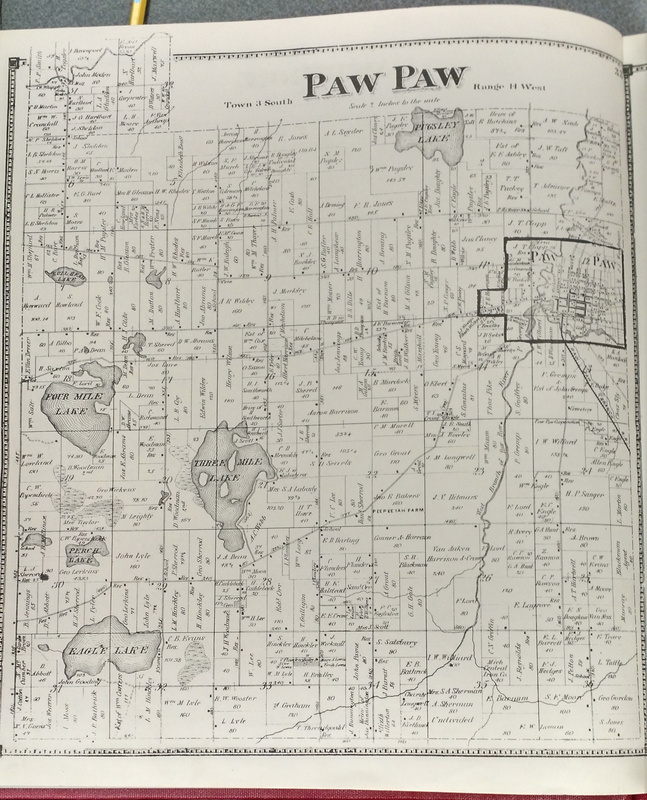 The land owned by Joseph Wicksall shows up on a Paw Paw land ownership map in 1873. The land is in Town 3 South, Range 14 West, Section 34 southeast of Three Mile Lake and South of the village of Paw Paw. Today this is the intersection of 68th Ave (358) and 40th Street, east of 40th and south of 68th. In 2016 the land still appears to be a 40 acre, single family farm. In the January 09, 1874 issue of the Paw Paw newspaper “The True Northerner”, you find “a report of the school taught in District No. 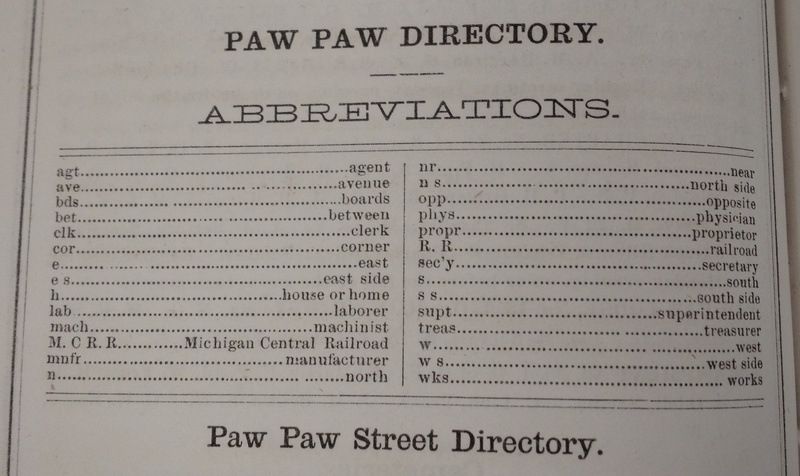 4 of Paw Paw for the first month; ending Dec. 26th, 1873.” In that report there is a list of “star scholars” with Ida Wicksal in physical geography and William Wicksal in B spelling class. The report is on the bottom right of the page. On February 3rd 1875 the family suffers the loss of Selena in Paw Paw. Selena dies in childbirth and the infant son is listed as stillborn. Although the spelling is clear on the original death certificate lines 16 and 17, Ancestry lists the name as Selena Wickeal. Selena is listed as being born in 1840 in England and her parents are listed as Zachariah and Selina Jones. Her obituary appears in the February 12, 1875 issue of “The True Northerner” with the text “WICKSALL - In the township of Paw Paw, on the 3d inst., Salina Wicksall, wife of Joseph Wicksall, aged 35 years.” The obituary can be found in the middle of the 3rd column. In October 2016 I visited Michigan and confirmed that Selena is buried in Cuddeback cemetery, 1.1 miles northwest of their home. Cuddeback is also known as Three Mile or Lyle Cemetery. 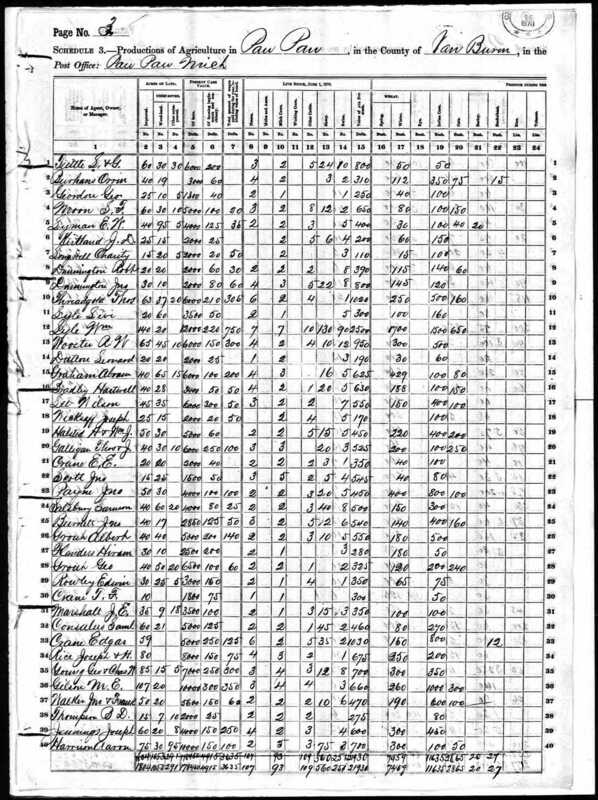 One online record for Cuddeback Cemetery lists a plot for Selena and Joseph Wexcel on page 46. 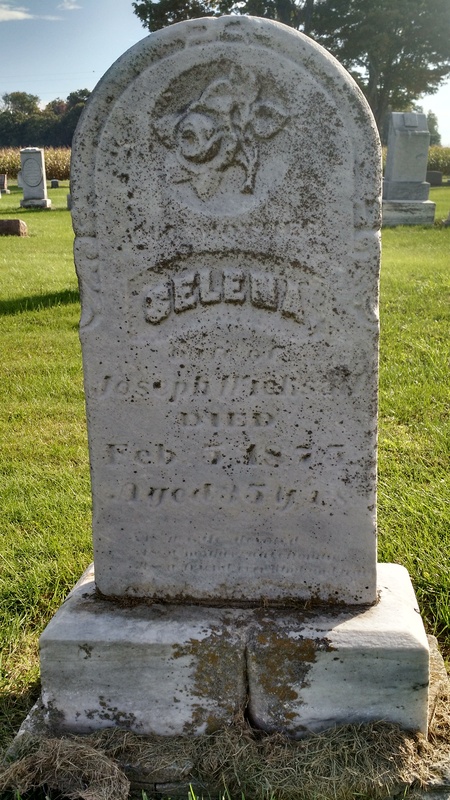 Another site http://www.rootsweb.ancestry.com/~mivanbur/CemCuddeback.htm lists only Selena with the correct date and a description of the headstone. The description reads “age 35 years - "wife of Joseph WICKSALL" - "Our Mother" - carving of rose, poem”. The headstone is weathered enough that reading the poem is impossible.